Happy new year to you all! In some ways 2018 has started as 2017 meant to go on… For example, another very high profile display of scientific ignorance and misconception at the very end of last year has set the tone. The statement is not just ill-informed and wrong, given the position of the orator it is also very dangerous. Simple knowledge and understanding can change and save lives. Learning about the hydrology of a river can lead to prediction and prevention of flooding. Learning about geology and coastal processes can protect communities from erosion. Learning simple techniques to acquire clean water and food, and maintain hygiene has numerous benefits. To me, knowing and understanding the difference between weather and climate is equally important to safeguarding lives and livelihoods. So two things for this blog entry, one is to help explain the difference between weather and climate, and secondly to give some insight to what it is like to be in a place so cold, and why it is so cold! Firstly, here’s a slide from a lesson I used to give to teach Year 8s (7th graders) about the difference. Have a go! The statements about fog, rain and a storm talk about singular events that happen at a specific moment in time. The other three are more generalised statements about longer periods of time. This is the fundamental difference between weather and climate, respectively. For those who prefer to read or dig a bit deeper, here is NASA’s page explaining the difference. So let’s now move onto the cold snap being experienced by the north and eastern North America. Looking at the land-masses globally, you can see that actually most places were warmer for that week in particular Eastern Europe, the Middle East, most of Russia, most of Antarctica and western USA (I’m sure the aforementioned tweet was not very well received by those in California who have suffered from wildfires recently). The deep cold being experienced is by comparison much more localised to northern and eastern North America. 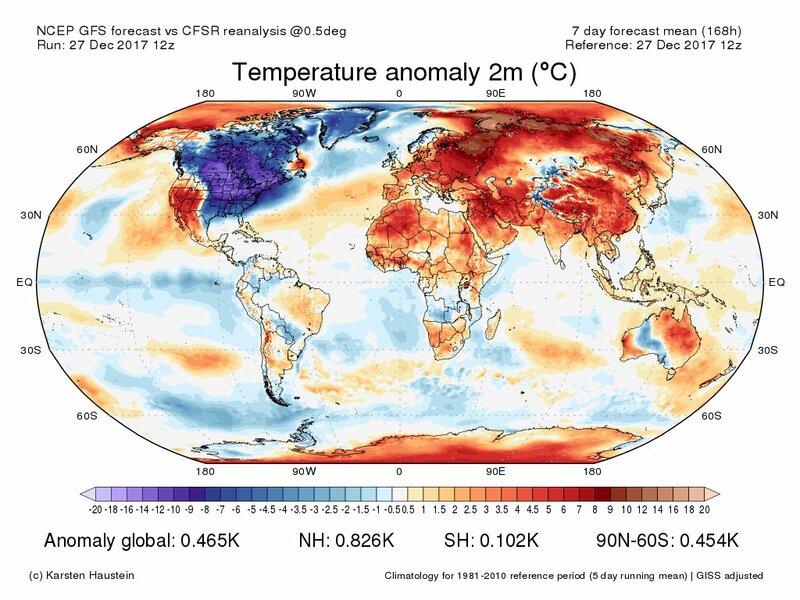 Temperature anomaly maps are an excellent way to visualise weather and climate together on one image; what is being shown is how different the weather is from the climate for that particular day or week. What should strike you is that give any particular month (in this case a select few Decembers), there are always patterns of warmer or colder weather in different parts of the world. 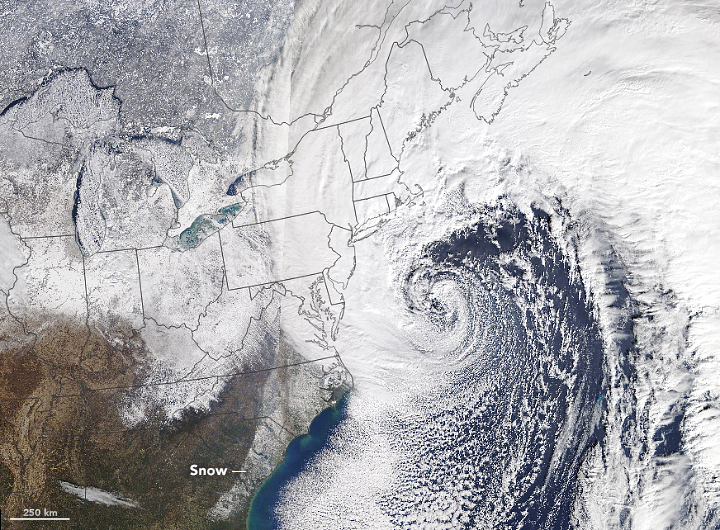 A cold snap in eastern North America is not uncommon either, seen here in the Decembers of 2013 and 2000. December 2015 showed that that part of the world was warmer than the average December. Here in the state of Minnesota, very cold temperatures in winter are part of the typical climate. As you can see below the average daily high temperature for the Twin Cities (Minneapolis-St Paul) for each of the winter months is below freezing (32*F/0*C). The main reason why it is so cold at the moment (weather), so much below the average (climate) is because the jet stream has taken an ‘omega block’ configuration, which is positioned perfectly to drive exceptionally cold air from the Arctic. This cold air is heavy and descends, creating high pressure and cloudless skies. So you have a combination of northerly bitter cold winds and cloudless nights allowing any tiny amounts of heat to just dissipate away. The animation below shows the jet stream winding up and down right at this very moment. The omega pattern is now starting to weaken, soon the jet stream will be less wavy and temperatures here will more represent the average for this time of year. An ‘omega block’ pattern of the jet stream driving frigid air from the Arctic to the USA. To conclude, it is certainly understandable that this cold snap and blizzard hitting parts of North America is a news-worthy event, one of which requires emergency management and the safeguarding of vulnerable people. However, recognising events which are signals of climate change are equally important and need the same amount of time, effort and resources in terms of management and safeguarding. These cold snaps hitting North America are not going to go away, but they are likely to become less common, while extreme heat events become more common. 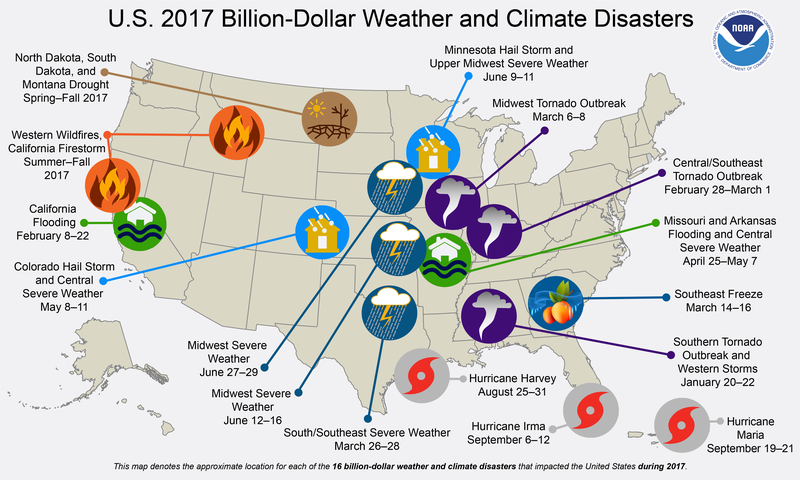 Post edit update: NOAA’s NCDC produced a good summary graphic showing the most expensive weather and climate related disasters to hit the USA in 2017 alone, shown below. The full article, worth a read, can be seen here. Given the robustness of climate science, those in power who misunderstand the difference between weather and climate, whether deliberately or not, are foolish at best and neglectful at worse.